Transferring powders from drums to process equipment such as reactors or mills can create dusty and hazardous conditions in a manufacturing environment and can be a source of worker exposure to hazardous substances in the pharmaceutical and bioprocess industries. Experienced biopharmaceutical manufacturers know that equipment designed for general industry use often falls short and rigid containment and transfer solutions for the biotech industry are often awkward and inefficient. Producers that embrace flexible solutions designed specifically for the challenges of our industry will find an advantage over competitors. ILC Dover is an industry leader in contained material handling solutions for high tech manufacturers and end users including NASA. The company’s flexible contained drum transfer system allows operators to empty the powdered contents of drums used in the pharmaceutical and bioprocess industries without exposure to the contents. The contents are also protected from potential contamination during the transfer process using this equipment. A flexible containment chamber made from ILC Dover’s rugged Armorflex material is anchored to a raised stainless steel frame using ergonomic bungee cords. The containment chamber includes a discharge sleeve, a drum sleeve, and 2 glove sleeves for operator manipulation of the drum lid and internal liner under contained conditions. A closed drum is placed on the integrated pneumatic drum lift and the drum sleeve is attached. The discharge sleeve is attached to a ring in the frame designed to interface with downstream process equipment. The containment chamber is at a height off the floor which allows powder to be gravity fed into downstream process equipment or containment solutions placed under it. 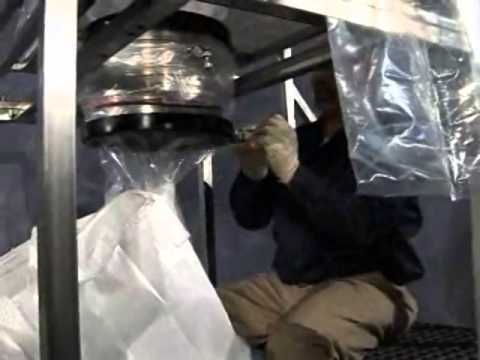 The operator then raises the drum to the containment chamber with the simple actuation of a lever and opens the lid using the integrated glove sleeves. This manual interaction allows the operator to ensure that all powder flows out of the drum liner to the next process stage without being directly exposed to it. When the drum is empty, its spent liner is placed inside of it and its lid replaced. It is then lowered back to the floor and discarded. The sleeves in the flexible containment system are twisted closed and crimped off ensuring no powder contamination of the surrounding environment. The containment chamber is then discarded and the process repeated for each new drum to be transferred. ILC Dover (http://www.ilcdover.com/) supports pharmaceutical and biopharmaceutical customers with disposable systems engineered to contain powder transfers from cGMP to nanogram levels.